Grandmaster Dronavalli Harika advanced to the pre-quarterfinals, crushing Bela Khotenashvili of Georgia in the second game of the rapid tiebreaker in round two of the world women's chess championship in Khanty Mansiysk, Russia. After the shocking ouster of Grandmaster Koneru Humpy, Harika emerged as the last remaining hope for the Indian fans and the lady from Andhra did not disappoint, winning with black in the second rapid game played with 25 minutes for each player. Having drawn the second game of the match as white without achieving much, Harika knew her chances were bright in the tiebreaker as she is known to be a good rapid player. A bronze medallist in the last two edition in the knockout format, Harika was at her best when playing black. It was the second rapid game and by transposition, Harika reached a Pirc defense, an opening that does not enjoy wide following in elite chess circles but at the same time something that promises a complex an uneven game. Harika got her chance in the middle game itself when Khotenashvili overestimated her position and did not follow one of the basic rules – divided forces often yield defeats. With her pieces serving on the queenside, the Georgian grandmaster decided to break the center and that proved crucial as Harika was ready to punish this audacity. 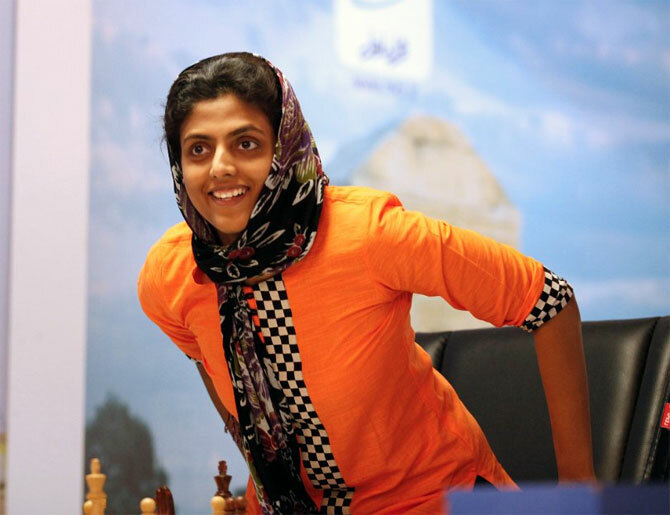 Harika soon exchanged the queens at the right juncture and piled pressure along the center to win a piece by force. The remaining technicalities were of little importance and it was all over for Khotenashvili after 50 moves. In the first game of rapid, Harika was close to winning as well but could not convert a nearly winning advantage out of a Caro Kann defense as white. In other big matches, Mariya Muzychuk of Ukraine came back from the jaws of defeat to oust Ekaterina Atalik of Turkey while Natalija Pogonina struck form at the right moment to beat unheralded Zhu Jiner from China. For Harika the chance to get in to the last eight are bright as she takes on Alexandra Kosteniuk of Russia in the next round. The Russian is a former world champion but Harika had beaten her handsomely in the previous edition. Earlier, Humpy's campaign came to an end after she lost to Jolanta Zawadzka of Poland in the second game of the second round here. Having drawn the first game as black rather easily, Humpy did not get the desired complications as white and her hunt for an elusive advantage ended on a disappointing note. Back in chess just before the Olympiad after a nearly two-year hiatus, Humpy, who has been among the top women players for a long time, will now have to wait for another two years to have a go at the next world championship cycle. Being ousted here in the second round might also mean that Humpy will need a direct seed in the proposed candidates tournament for women. It was a Queen's gambit accepted by Zawadzka through transposition from the opening and Humpy kept the position balanced for a long time. Slow manoeuvring in the middle game saw the rooks pair getting traded and the queen and minor piece endgame looked like headed for a draw. While the draw would have kept her in contention in the tie-breaker, Humpy decided to go for the breakthrough on the king side that compromised her own king's position. Zawadzka was quick to pounce on the opportunity and some finely crafted manoeuvres saw her winning a pawn in the minor piece endgame that ensued. The technicalities were not complex enough and the Polish won after 78 moves. Pairings round 3: Zhai Mo (Chn) vs Ju Wenjun (Chn); Jolanta Zawadzka (Pol) vs Abdumalik Zhansaya (Kaz); Natalija Pogonina (Rus) Kateryna Lagno (RUs); Anna Muzychuk (Ukr) vs Antoaneta Stefanova (Bul); D Harika (Ind) Alexandra Kosteniuk (Rus); Alisa Galliamova (Rus) vs Lei Tingjie (Chn); Alinasab Mobina (Iri) vs Mariya Muzychuk (Ukr); Gulrukhbegim Tokhirjonova (Uzb) vs Valentina Gunina (Rus).